Basic sleeveless scooped neck catsuit by Jaxs. Long leg. Jazz overall "Victoire" of the brand Temps Danse made of a soft touch and natural fabric: Viscose.The great advantage of viscose, besides comfort, is its better absorption capacity than cotton.Wide straps for a perfect fit and stitching on the front.The combination can also become a Jazz pants with a wide waistband. 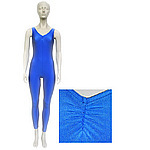 Basic sleeveless turtle neck unitard by Jaxs with a large keyhole back and long leg. Catsuit "Marjolaine" by Vicard with broad V-shaped straps and a deep back line. Princess seams in the front. Catsuit "Selina" by Vicard with the upper front part made of velvet in a wrapped look. Tied in the back. Combination of Lycra and velvet gives it an elegant look. Jazz Catsuit by Jaxs with a Boatneck and capri legcut. Made of Lycra.